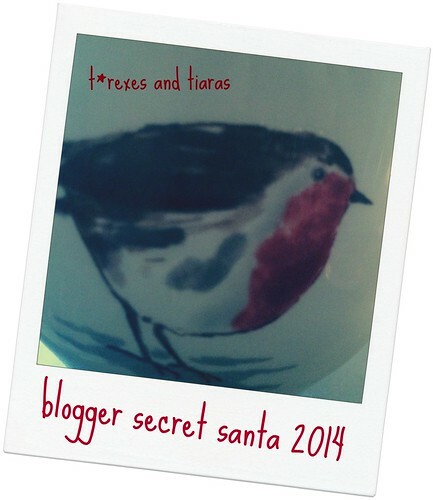 t*rexes and tiaras: Blogger Secret Santa 2014.. So, it's that time of year again, where even the greatest Scrooge (me!) gets on that tinselly-bandwagon and arranges the annual Secret Santa swap. Are you in? Once sign ups close, you'll then get an email with details of who you will be sending to. As this is a SECRET swap, this won't be the same person who is sending to you, but it's up to you if you'd like to let your recipient know who their gift is from when you send it. For overseas people, you're more than welcome to take part - drop me an email and be sure to let me know if you're OK with sending to another country - last year we had folks from the US, South Africa, France and Germany! Then, you need to take a look at your recipient's blog, find a gift you think they'll love and post it off to them. The posting deadline will be 8th December. Please be sure to let me know when you have posted and when you have received your parcel, so I can tick things off and chase up any lost parcels. This swap is always such fun to run and seems to get bigger every year, so please spread the word! Wahoo, sign me right up for this please! Yes please! I didn't do one last year and missed it! What a great idea - I'll send you an e-mail straight away. I'd like to be a part if I may, do you still have details from last year, if not I will send out another email. Yay. I haven't taken part in any swaps in a while and I think Christmas is the perfect excuse to do one again. I haven't done one of these in a while -sign me up! Emailing you now.